Born: 8 January 1935 in East Tupelo, Mississippi, USA. Died: 16 August 1977 in Memphis, Tennessee, USA (aged 42). Presley is one of the most celebrated and influential musicians of the 20th century. Commercially successful in many genres, including rock 'n' roll, pop and gospel, he is the best-selling solo artist in the history of recorded music with estimated record sales of more than a billion units worldwide. He won three Grammys, also receiving the Grammy Lifetime Achievement Award at age 36, and has been inducted into a.o. Rock and Roll Hall of Fame, Country Music Hall of Fame, Rockabilly Hall of Fame and Gospel Hall of Fame. 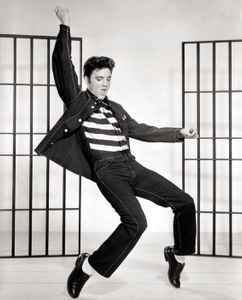 He is often referred to as "The King of Rock and Roll", or simply, "The King". His parents were Gladys Presley (mother) and Vernon Presley (father). Father of Lisa Marie Presley, daughter from his marriage to Priscilla Presley (1967 to 1973).